"In a sense, it's good to visit Korea. It's a good corrective for those who see solely what is going on here." Seoul is a "corrective"? Under the current president "laxative" sounds like the operative word, as in, "I need a... because I am full of (expletive deleted)." SEOUL, South Korea -- South Korea's president vowed Tuesday to strongly defend a string of disputed islets against Japanese claims, saying that Tokyo's actions were tantamount to a rejection of Korea's independence from its previous colonial ruler. "We will react strongly and sternly against any physical provocation," President Roh Moo-hyun said in a nationally televised address. "This is a problem that can never be given up or negotiated, no matter at what cost or sacrifice." The islets -- known as Dokdo in Korean and Takeshima in Japanese -- are currently under South Korean control. The long-running dispute over the territory flared anew this month when Japan said it would conduct a maritime survey in waters surrounding the islets. After negotiations in Seoul, Japan agreed to cancel the survey as long South Korea delays its move to officially register the Korean names in the area. Roh, appearing solemn, reiterated Tuesday that it was South Korea's "given right" to register the Korean names. "To our people, Dokdo is a symbol of complete restoration of sovereignty," the president said, calling Tokyo's territorial claim "an act that denies Korea's complete liberation and independence." "We will never tolerate this," Roh said. So what are you going to do, sink a Japanese coast guard cutter as it tries to conduct a sonar survey? What? What? The South Korean side suffered a humiliating whipping in the emergency talks over the weekend. In a more just world, where the Universal Law of Averages would apply, the Koizumi government, after tricking its South Korean counterpart into hypernationalist overreaction, would turn around and tell its own nationalist wing to go bug off and recognize the reality and legitimacy of the South Korean hold on Tokdo. However, real life--i.e., real, adult, experienced life--is unfair. Deus does not descend in his machina to put everything to rights--and Junichiro Koizumi does not feel it is his duty to give suckers an even break. * Full disclosure--I have never been to Taiwan, either. The last time I was in the PRC was in--take a deep breath, now hold it, hold it--1985. My last trip to anywhere on the Asian continent was to Vietnam in 1995. Now you know that I am full of (expletive deleted). A not insignificant number of Japanese policymakers and thinkers harbor a fear of a Chinese tsunami of economic, political and military influence sweeping the United States out of the Western Pacific--leaving Japan alone to face a new hemispheric hegemon. For these alarmists, Wen Jiabao's visit to Fiji to meet with the heads of seven Pacific island nations was wailing siren warning of a changing of the guard in the South Seas. For the past two weeks I have been flogging a rather unfashionable contrary view. The PRC, rather than going from strength to strength in the Pacific, has been hitting a wall. Indeed, in terms of China's most important foreign policy initiative--the cutting off the diplomatic oxygen of the Taipei government--China is reeling from a series of reversals. In 2003 in Kiribati, where China had one of its two overseas satellite tracking stations (the other is in Namibia), China backed the wrong sibling in a presidential election between two brothers. The new president upon taking office switched recognition back to the Taipei government. In 2005, Nauru annoyed that Chinese officials had made insufficient efforts to get Nauru's one passenger jet out of receivership in the United States, switched . Wen Jiabao's trip to Fiji, where he was greeted by such notables as the prime minister of the New Zealand dependency Niue (pop. 2166), was a confession that Chinese diplomats had lost control of relations with governments of the region. In terms of the populations of the countries involved, this showcase event was the equivalent of flying across the ocean to visit a handful of Shanghai neighborhood associations. If the Beijing government is willing to be a party to deals like this one, Japan really has nothing to worry about. In my analysis, however, I forgot a vital point: governments are not the only actors. The indigenous peoples of the Pacific also have a say in the game--and sometimes, as in the past few days in the Solomon Islands, the native peoples are not finding they can accept the new paradigm peddlers' meddling. 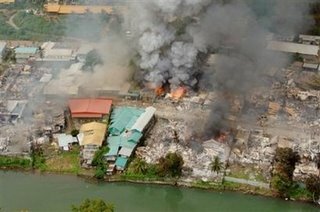 Fires raging out of control in the Chinatown section of Honiara, Solomon Islands. Source: AP. 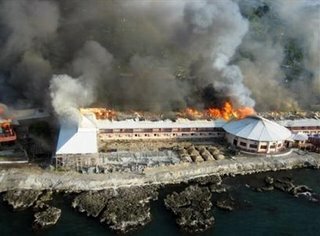 Chinese-owned Pacific Hotel on fire. Honiara, Solomon Islands. Source: AP. 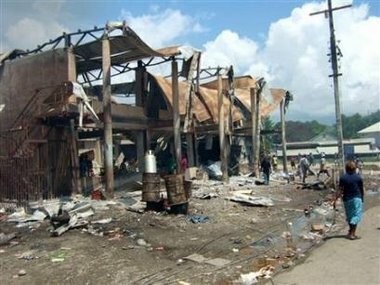 Remains of stores in Honiara's Chinatown. Source: Reuters. For the record, the Solomon Islands recognize Taiwan. Many of the owners of the businesses burned down this week, however, hold PRC citizenship. Melanesian-ethnicity Solomon Islanders probably do not care: their view is that islands politics is polluted with donations from both the Taiwanese and PRC governments. The rioting, looting and burning are, in a sense, "a pox on both your 'Chinas'". I hesitate to open the International Herald Tribune/Asahi Shimbun this morning. If the editors of the Asahi Shimbun have had this translated into English, white-hot beams of searing stupidity might burn holes straight through to the back of my skull, causing my brain to leak out, killing me instantly. Now the Asahi Shimbun has always set the standard in economic idiocy among the readily available newspapers. However, Keizai seicho: yutakasa o sasaeru tame ni is, to borrow a cycling term, beyond category. On a scale from one to ten, it is an eleven. Economics is the disciplined study of tradeoffs and sacrifice. Discussion about the goals of an economy is enriched when a writer confronts the readership with the hard choices facing the nation. Discussion is impoverished when authors write down a list of "nice thoughts about jobs and innovation and competition and globalization" without examining the costs or ever, ever mentioning the word "profit". Suffice to say, this op-ed does the latter. Later - Well, they have done the dirty deed. Here is the editorial opinion in English, in all its platitudinous glory. Feeling guilty, feeling scared, hidden cameras everywhere! I am more than somewhat bummed. The Nihon Keizai Shimbun has run a fabulously paranoid series of articles but the Internet powers that be have chosen to not post these articles on the Nikkei Net website. What a pain in the tail. Yodo suru sekai: Kawaru rikigaku [in Eng. - A Wobbling World: the changing dynamics] fleshes out the realist right's darkest fantasies about Japan's place in the world. On Sunday, Part 1 Ikkyokutaisei no hokorobi [The Fraying of the Unipolar System] describes a Sino-Russian-led challenge to America's hyperpower status. On Monday, Part 2, Chotaikoku no genkai [The Limits on Superpowers] offers evidence that the Bush Administration cannot reorder the world according to its liking. The grand finale Miugoki dekinu Nihon [Japan Caught in a Catch-22] , published on Tuesday, is a cry of "Lasciate ogne speranza, voi ch'intrate" unless, of course, the Koizumi Cabinet does exactly what the four authors suggest in the second-to-last paragraph. For me, it is all great fun--like Heritage material in Japanese. Anyway, neither the series nor the similarly paranoid supporting articles Shigen no henzai "Tsunabiki" umu [The misallocation of resources that gives rise to a "tug-of-war"] and Ajia gaikajumbi no tsukai michi [The way to make use of Asia's currency reserves] is available on- line. This is bad. We live in a time of populism and economic expansion. If the paranoid want the people to buy into their vision, they need to offer up their fears for free. Now on the other side of the globe, the Council on Foreign Relations is going in the opposite direction. Like the indefatigable Brad Setser and his international macroecomics blogging, the CFR seems intent on drowning us in more material than we can digest in a reasonable amount of time and still have a life. Check out these posts/on-line essays. Tokyo, April 17 -:China has banned ship traffic around a disputed gas field in the East China Sea that is claimed by both Beijing and Tokyo as Chinese workers lay pipelines and cables to tap its resources, Japanese media reported on Sunday. The move is certain to spur protests from the Japanese Government, which has been deadlocked in negotiations with China over rights to the undersea energy deposits. The Pinghu gas field lies in an area that straddles a median line that Japan considers the border between the two countries' territorial claims. China, however, makes a wider territorial claim that envelopes the entire field. 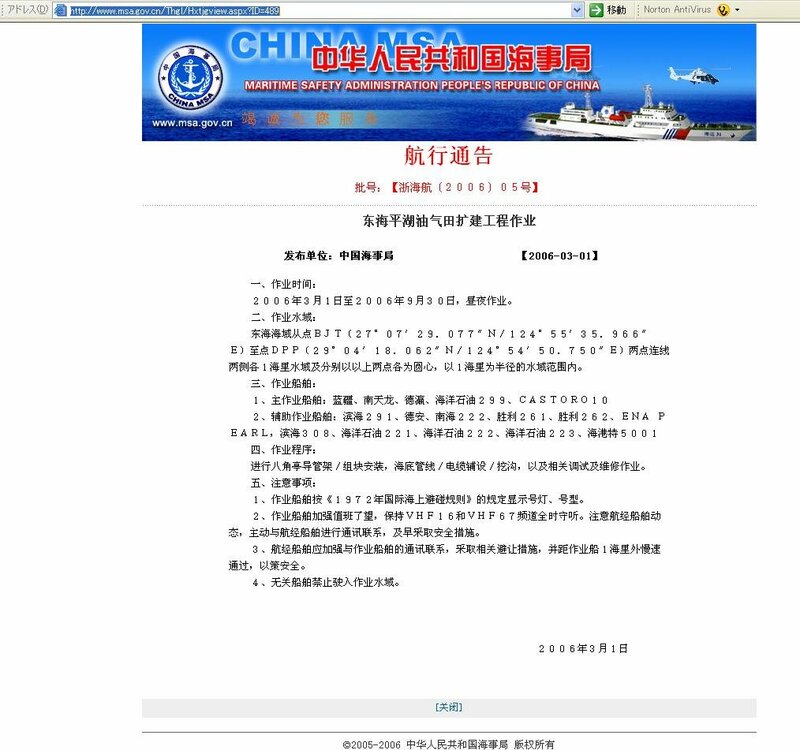 Chinese maritime authorities have posted a notice that all unauthorised ship traffic will be banned in the waters around the Pinghu field from March 1 to Sept. 30, Kyodo News agency and Fuji Television Network reported. "Oh, God. Here we go again. Either they have the coordinates wrong, or the warning is mistranslated, or the damn thing existed only in the imaginations of a couple of Shanghai-based stringers. Anything to get the crazies going among the commentariat." Hence my stammer-inducing astonishment when it turns out that the report is true, in all its particulars. 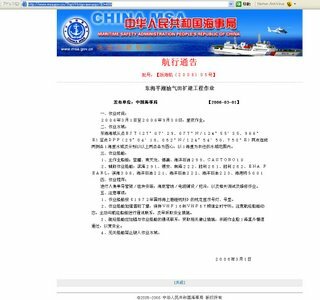 For as long as the China MSA keeps the notice up on its website, you can access it by clicking here. Mon Apr 17, 2006 10:27pm ET-TOKYO - China has told Japan it will revise its ban on ships entering an area of the East China Sea that straddles a disputed maritime border with Japan, Japan's Foreign Ministry said on Tuesday. China told Japan it made "technical errors" in imposing the maritime traffic ban and would revise it so that it did not go beyond a disputed median line drawn by Japan to separate the two countries' 200 nautical mile exclusive economic zones, the Foreign Ministry said in a statement. "I got the impression that it was a simple mistake," Japan's top government spokesman, Shinzo Abe, told reporters. "I believe China is well aware of the nature of the area." All is well. Restored is my naive confidence in the underlying sanity of the Chinese leadership. And the humble pie was delicious. Eeeek! A robotic talking point! Whom does Kan Naoto think he is fooling with his "Ozawa will speak to the country bumpkins while I speak to the city folk" routine? Not himself, I hope. I will give Kan credit for being quick on his feet. Only a few days after getting trounced in the Democratic Party leadership election, he is already talking about the vital role he will be playing in the party's future success. What was a throwaway line in an interview with the Nihon Keizai Shimbun on Friday by Sunday had metamorphosed into a full-fledged winning strategy for the party. Indeed, by Sunday, Kan's description of his responsibilities had expanded. Ozawa would still be in charge of the bumpkins and Kan the city slickers, but Kan would also be "building networks reaching out to the baby boom generation (dankon sedai) living in Tokyo and Osaka, where the great failure was last year." Oh, darn. My B.S.-O-Meter just blew up. First, it is hard to think of a way the leadership of the Democratic Party could have indicated more clearly the party's intellectual bankruptcy than by holding a leadership election where the winner turns around and appoints his opponent as his deputy. Why the hell did you run the election, then? Just hand out the goodies ("Sweets, sweets for everyone!") and get back to the business of slitting your bellies. Second, I like Kan a whole lot. His smarts, savvy and charm prevented the Democrats from being swept out of the Tokyo bloc area district seats. Still, what are these networks he is rambling on about? What is their organizing principle? Parent-Teacher Associations? The Red Feather organizations? Homeowners opposing the construction of 14 storey apartments blocks outside the city center? Third, no matter how the DPJ may dream, it cannot avoid choosing between representing the rural districts or the urban districts. There is room for only one Janus-faced party in politics and the LDP is it. As the institutionalized party of largesse, the LDP is the default rural vote, even as Koizumi seduces and caresses the suburban and urban electorate with his tongue. As the challenger, the DPJ must run as the party of opposing policies. Hence the constant, disheartening run into a tornado-like headwind: the needs of the rural districts are in diametric opposition to the needs of the urban and suburban areas. For the one to thrive, the other must be bled dry. The belief that the DPJ can be the Country Mouse / City Mouse Party is a fairy tale. While we're on the subject of the long road stretchin' out ahead for Kan, Ozawa and the DPJ, check out Doug Turner's op-ed "Get This Party Started" in Time Asia. Mr. Turner gets it all down, right there on the page, even though he is not, as far I know, a certified member of the Ancient and Hermetic Order of Japan Old Farts. Damn! Kind of a bogus poll, but still, ouch! * (Results of a poll of 500 legal adults living in urban areas conducted on April 13, 2006. Results printed in the morning edition of the Sankei Shimbun of April 17, 2006). It looks as though I was too cynical back in January. The kids are really arriving next month. Goodness knows what good 10 days in Japan will do. Who will be their hosts--i.e. who is certified 100% politically safe and has sufficient living space to share with these kids? Will they be left alone with these families? April 13, 2006 - China and Japan have agreed to strengthen educational co-operation and cultural exchanges by sending more young people to visit each other's nation. The Ministry of Education told China Daily yesterday that starting this year, China would send 1,250 senior middle school students to Japan each year. The same number of Japanese students will also come to China annually, to gain a better understanding of the country. About 1,100 of the total 1,250 students will stay in Japan for 10 days, and others will undertake yearly or half-yearly study programmes, said Xue Yanqing, director of the Asian and African Affairs division with the ministry's international co-operation and exchanges department. "We hope young people from both countries can gain a true understanding of modern China and Japan, so that misunderstandings and prejudice brought about from history can be cleared up," he said. The first group of 200 students to visit Japan will set out in May and are being hosted by the Tokyo-based Japan-China Friendship Centre. Students will visit three to four cities in 10 days and visit houses of local residents to experience a day in the life of an average Japanese person. The ministry said all 200 students had been chosen from senior high schools nationwide. Preferential policies will be given to remote areas in recommending students. The Chinese government's relations with Japan are handled by the Asian and African Affairs Division? I am intrigued by the "preferential policies will be given to remote areas in recommending students" claim. If it is not just rhetoric, it sounds like absolutely the most fantastically dangerous idea the government of China could have ever dreamed up. In a notice announcing Dr. Lily Gardner Feldman's very stimulating presentation on postwar reconciliation held last week at Temple University Japan, Andrew Horvat tossed out some rather surprising figures comparing the wealth of civil society organizations bridging the divides between Germany and its former wartime enemies and the paucity of civil society ties in East Asia. Each state of Australia has an active sister-state relationship with a Japanese prefecture. There are 99 sister-city links and 369 partnerships involving higher education institutions. About 300,000 young Australians are learning Japanese today. Add to that the 44 Japan-Australia societies in Japan and 15 counterpart associations in Australia, and you can begin to comprehend the strength of the people-to-people links. So how many sister-city relationships are there between Japanese cities and Chinese cities? And if the Australians can forgive the Japanese, cannot pretty much anyone? Gratuitous view of Mt. 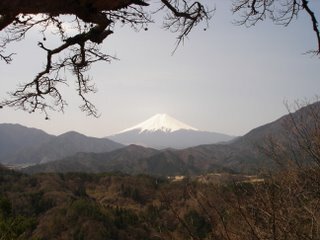 Fuji in a Japan blog...bah! Of all the cheesy, overexposed images to post, I had to post mine.